Indipendent villa surrounded by a a nice large garden. Located in a quite lovely position , just a short distance from the center of Pula , the prestigous Is Molas Golf Club, the beatiful beach of Nora. Recently restored, well furnihed, equipped with every comfort. This was a great property for our family of 5. Has a great feel of an authentic Sardinian home, nice furniture and paintings hung on the walls. 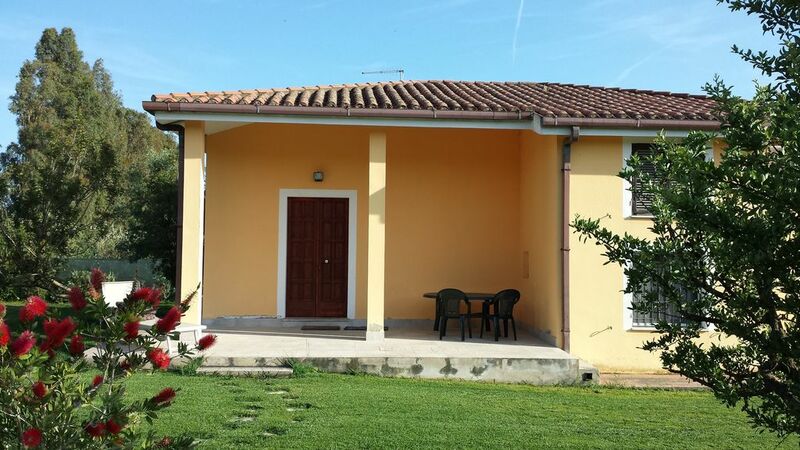 Located on a small quiet lane off a minor road near town of Pula (10min drive). It had everything we needed including high chair for the baby and all towels/linens provided. Washing machine very helpful too. The garden is enormous. Very friendly and accommodating owners. Comfy sofa for relaxing after the kids were in bed. Blackout shutters so you can sleep in late in the morning. Well equipped kitchen. “Conad” supermarket less than 10m away with everything you might need to buy. We were surprised that the tap water wasn’t drinkable - and so you need bottled water for drinking/cooking, and perhaps because of the exceptionally damp weather at the end of October weather we experienced a lot of mosquitoes. But we had a good time none the less. Very convienient for the amazing beaches at Chia, Pula, Roman ruins at Nora and with a car Cagliari is easily done as a day trip. Easy drive to/from the airport takes about 50 minutes. Would recommend this property, especially in for the warmer months when the outside space must really come into its own. The house was set in a large garden in a quiet, country area with other similar houses nearby. It was completely private and overlooked no one. It was near to Pula with shops and a good selection of places to eat. The house was very clean and had everything you need to have a relaxing holiday. There are lots of beautiful beaches nearby and interesting places to visit. The owner and her husband were very friendly and helpful. We would definitely recommend this house to anyone! "The accommodation itself was clean and had everything you needed to make your stay optimal in every way. We really enjoyed the large garden and the peacefulness. Furthermore the property is ideally located to visit numerous beautiful beaches (don't miss Tuerredda beach!). Pula itself is also a lively small town worth a visit. We really loved our stay and would recommend it to everyone. It goes without saying that we will certainly return here, as the owners are very pleasant people." Ein schönes und sehr gepflegtes Haus mit netten Vermietern. Wir hatten einen sehr schönen Aufenthalt in der Unterkunft und können diese auf jeden Fall weiter empfehlen. In näherer Umgebung findet man alles was man braucht... Einkaufen, Agriturismi, Restaurants oder Shoppen in Cagliari. Ein Auto ist natürlich notwendig. Die schönsten Strände erreicht man in wenigen Fahrminuten. è stato un piacere avervi come ospiti. Spero torniate l'anno prossimo. La casa è fedelmente come descritta e come si vede nelle foto, situata in una zona molto tranquilla e ben isolata da qualsiasi "rumore molesto". Situato a brevissima distanza da ristoranti, supermercati ed altri punti di interesse. Strategica anche la distanza delle spiaggie più belle della zona. I proprietari sono molto cordiali e disponibili in tutto e per tutto, flessibilità orari laddove possibile, suggerimenti su spiaggie e ristoranti.....ecc. L'unico appunto che posso fare è relativo al "pentolame", non proprio adeguato alle 6 persone che possono essere ospitate dalla casa; probabilmente avendo parecchi clienti stranieri questa "dèfaillance" non è saltata all'occhio ma per me ed i miei amici a cui piace mangiare e di conseguenza cucinare ritengo che la cosa abbia creato un piccolo "neo" nella valutazione globale. Comunque se dovessi tornare in vacanza nella zona verificherò di sicura la disponibilità di questa struttura poichè ritengo che abbia un ottimo rapporto qualità/prezzo. Grazie per la bella recensione e per il suggerimento relativo alle attrezzature. Effettivamente nessuno me lo aveva mai segnalato. Provvederò sicuramente ad integrarle. Spero di potervi avere nuovamente come miei ospiti. From Cagliari Elmas Airport follow the direction for Pula (SS195) . At km 30 take the exit on the Wright for "Is Molas" . Drive for 2 km then turn left at the third crossing after The sign "S'Abuleu". Pula is a cosy touristic town full of amenities, like restaurants, pubs, discos. The trendy disco is the Tzunami located only few km far from Pula. The nearest beach is Nora but there are a lot of other beautiful sandy beaches all along the coast like Santa Margherita, Chia , Teulada and many others. Don't miss The amazing Archeological site of Nora.